Amaze and delight yourself and your friends with these out of the box designs! Contact me today to experience the time-saving fun of creating with punches! Did you know punches are one of the most popular items in the Stampin’ Up! catalog? Detailed planning and design goes into creating versatile punches that coordinate with exclusive stamp sets so you can quickly and easily create fantastic projects. Many people love finding out that there is often more than meets the eye when it comes to punches. Join my class and learn four unique, and sometimes unexpected, options for the Blossom Petals Extra-Large punch. 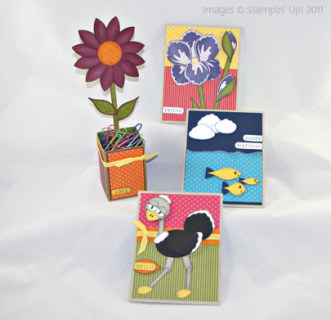 INVESTMENT: $15/person includes all supplies to make and take home 3 cards and flower box. DATE & TIME: Choose ONE or schedule your own!